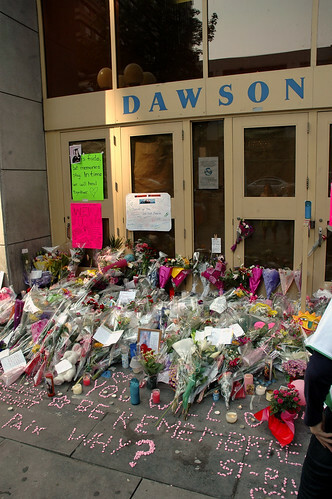 Memorial to the September 13 2006 Dawson College Shooting Rampage, originally uploaded by caribb. When the news broke last week of the shootings in Dawson College, Montreal, it sent shivers down spines in my household. This was for two reasons. Firstly a family friend works in the college. We called and he was ok, although he had been at work and had heard the gunfire. Secondly it brought back memories of a terrible day in December 1989 when a crazed misogynist went into the Lécole Polytechnique de Montréal, separated the women from the men and shot dead 14 women. My partner had been in the college in the morning and was going to go back in the afternoon to see a guy about an Amnesty International stall, but managed to get him on the phone, so she didn't go in. December 6th is still a day of remembrance in Canada and also a day of action against violence against women and we should remember it still.